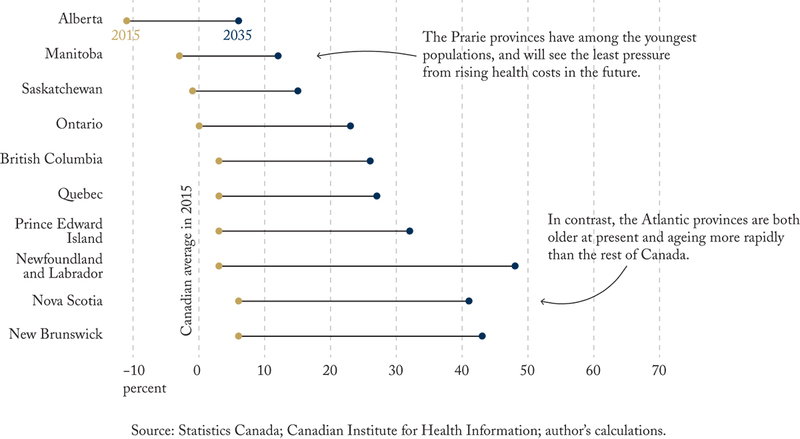 Over the next two decades, Canada's population will grow, and grow older, driving up health costs. This edition of Graphic Intelligence shows how uneven this growth will be across provinces, relative to the Canadian average in 2015. Longer bars indicate faster ageing, and points farther to the left are younger populations. How will Canadians pay for these rising costs? To read more about these challenges, and especially how they relate to federal transfers, read the Intelligence Memos blog post titled Beware the Alchemy of Age-Adjusted Health Transfers, by Colin Busby and Aaron Jacobs.